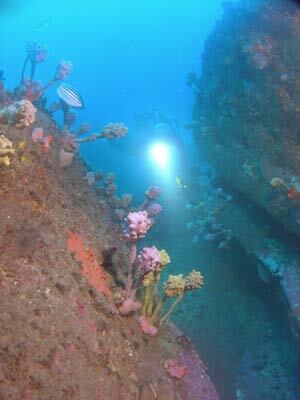 Michael McFadyen's Scuba Diving - Yellow Rock The coastline of the Eastern Suburbs of Sydney between Sydney Harbour and Botany Bay has literally hundreds of very good dive sites. Unfortunately, charter boats only visit a couple of sites, mostly those just south of Sydney Harbour (eg The Gap, The Colours and Bondi Wall) and Magic Point Sharks. For a short time till early 2004 there were two charter boats operating regularly out of Botany Bay but there may now only be one (or not even one). 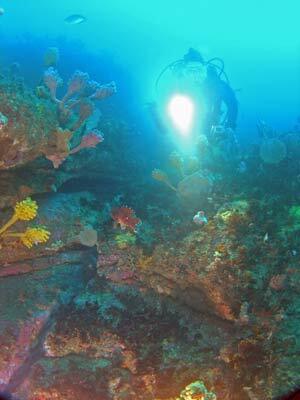 This is amazing to me as there are so many dive sites that are as good as any others elsewhere in Sydney. Over the past 20 years, I have tried to explore as much of the coastline as I can using the boat that I own. 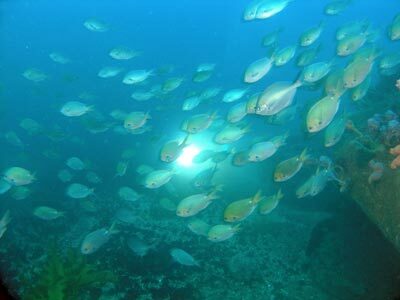 I have now dived nearly all the coast from Clovelly to Botany Bay and some of the best dive sites we have found have been behind Long Bay Rifle Range. 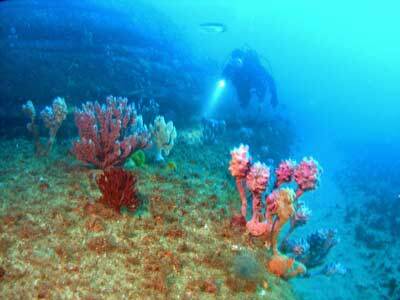 These include Red Flag and Rifle Range Reef. The south-eastern corner of the rifle range is Yellow Rock, the most notorious rockfishing location in Australia. Something like 100 fishers have died at this location after being washed off the rock platform into the ocean. This was a very attractive fishing spot as the Malabar Sewage Treatment Plant poured virtually raw sewage into the ocean through an outlet at this location. On 22 September 1990 a new deepwater outlet came on line, the start of the end of almost 200 years of pouring raw sewage into the ocean off Sydney. This new outlet sends the treated sewage over four kilometres out to sea. As soon as this outlet was put into use, the waters at Yellow Rock became clean overnight. Within a year, the kelp, sponges and other fixed marine life returned to health from the previous stunted form. It was soon after this that we started diving this area. 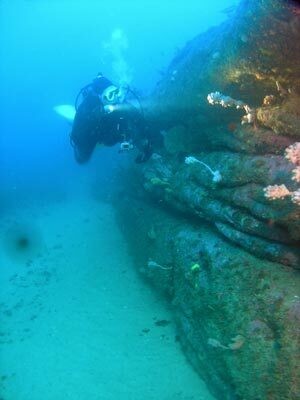 In 1997 I did a drift dive from north of Yellow Rock to the wreck of the MV Malabar. The start of this dive was every interesting. However, it was not until mid-2004 that I returned to this location to dive it again. To find this spot, turn left when you leave Botany Bay and travel for about 4.3 kilometres north till you are just off the corner of the rifle range. You will see Yellow Rock a little north of the actual point (the rock now is no longer yellow since the sewage stopped being dumped here - it is now green from the weed growing there). Anchor about 50 metres north of Yellow Rock. The GPS mark for the anchoring spot is 33° 58' 07.6"S 151° 15' 57.0"E (note that all my GPS Readings are using AUS66 - if you use any other datum, you will need to convert the reading - see my GPS Page for more details). The bottom here comes up from about 26 metres to 23 metres in a gradual rise over a bottom composed of small rocks. It then jumps to 17 to 20 metres and then 10 right next to the platform. Since you are going to anchor very close to the platform, you will need to have relatively calm seas and certainly north a north-easterly or easterly wind which would hang your boat back almost on the rocks. Anchor in the 17 to 20 metre location. Once you have descended, head north along the 22 metre contour. The bottom is composed of small rocks interspersed with sand. There is a fair bit of kelp as well. After 10 minutes, head up into the shallows and come back south. You will soon see a large crack that runs into the rock platform. This is about 15 metres deep at the mouth and comes up to about 10 metres at the end. The bottom has lots of car bits, engines, whole rear axles, wheels and other parts. These were dumped years ago from the top of the cliff (probably over 35 years ago as the road was well blocked off by then). Heading south again you will see more car parts and then some large overhangs. Back near where the boat is anchored in the shallows under the rock platform, there are some excellent swim-throughs and caves. These are sort of connected and you can swim from one to another with short sections outside in gaps between huge boulders. Both the caves/swim-throughs and gaps are full of fish, seapike and yellowtail mostly. In the caves there are lots of very large eastern rock blackfish and luderick (the main species the fishers are after). In August there are lots of Port Jackson sharks and I have also seen a number of wobbegongs and a very large black ray. Examine this area for all the caves. Head out a little to 20 metres and follow this depth north and you will soon see the boat and/or anchor. If you are a little south of the mark, there is a wall that runs north-south. The top is about 20 metres and the bottom about 24 metres or so. This has some nice small overhangs, some of which are home to eastern blue devilfish. You may also see sea dragons. There are a lot of black reef leatherjackets and one-spot pullers. The wall has heaps of sea squirts and some small gorgnias. 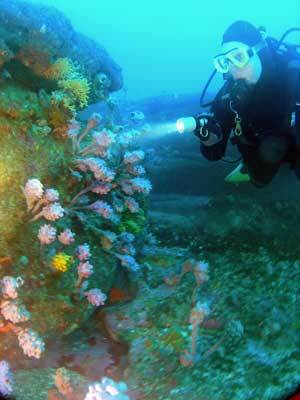 A very good dive site, worth many dives.